Tomorrow the Ballymore team head to the Counties Racing Club's meeting at Pukekohe with one runner on their premier race day. The Makfi mare, Ruby Armani (pictured) gets her chance to gain black type in the $100,000 Gr. 2 NRM Auckland Thoroughbred Breeders' Stakes for the owners involved in Kylie Bax's B.A.X No.2 Syndicate. "She's no stranger to black-type company, having raced against the best three-year-olds in the country last season, and we're happy with how she continues to come up this preparation," co-trainer Pam Gerard said. 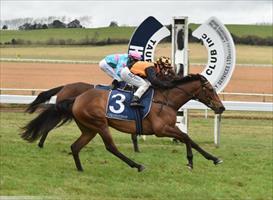 She has drawn to get a cosy trip from barrier 4, and hopefully senior rider, Matthew Cameron can take luck out of the equation for the Blandford Lodge bred mare, in the race which has attracted a strong field for the fillies and mares over 1400 metres. "She's obviously not well off in the weights, we're confident that the track, rider and draw will all play heavily into her favour. She's a chance of giving this field a shake despite her long shot odds." The race is due to run at 2.45pm. Good luck to all connections.